Lambeth Wellbeing Fund is looking for projects led by local residents who are creating their own solutions to improving the health and well-being of people in their communities. You can apply for up to £5,000 for a project. Go to the Lambeth Wellbeing Fund online application form and click the ‘Apply’ at the top right. Deadline for all applications is 5pm on 26 October 2018. Weir Estate TRA in Clapham organised a very well-attended summer garden party on Saturday 28 July when residents from across the estate came together to socialise and enjoy the sun. It was such a success they are now looking to make it an annual event. Engie (previously called Keepmoat) have again agreed to sponsor Furzedown United in Streatham as part of their community benefits programme. 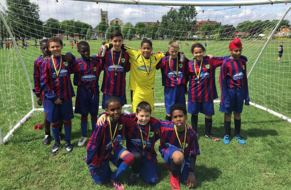 From seven children three years ago, there are now 50 involved in Furzedown United’s various teams. A great example of a community partnership in action. Level 2 Scrutiny course will start on 20 September for 12 weeks, 6pm to 9pm at Lambeth Town Hall. Level 2 Food Hygiene course will be held on 28 September 10am to 3pm at High Trees. Level 3 Award in Education & Training will start on 2 October for two days a week on Tuesdays and Wednesdays 10am to 3pm for seven weeks at High Trees. The next round of Area Board meetings will be held in October. At July’s meetings, members scrutinised the quarterly performance reports. Concerns were raised about anti-social behaviour (ASB) performance and a workshop has been arranged for 24 September to take a closer look at it. The next assembly will focus on major works and will take place on 10 September at the Town Hall starting at 6.30pm. A date for the annual Residents Assembly is still to be finalised with the Coordinating Committee (the three Area Board chairs and vice-chairs) but agenda items including fire safety, a review of the new engagement structures and repairs have been agreed. The communal repairs task & finish group has met for the first time. Drawn from Area Board members and residents who have completed the scrutiny course, they will next meet to start reviewing contractor performance and the post-inspection process. If you are interested in attending the major works assembly or want more information on the Area Boards please contact Erin Healy on 0207 926 8299 or email gettinginvolved@lambeth.gov.uk. If you’re over 55, on a low income and looking for expert advice to understand and manage your tax situation, Tax Help for Older People is here to help. Tax Help for Older People is a charity supporting people across the UK, free of charge. You can telephone them or for more complex cases they can arrange for you to see one of their volunteers. Contact Tax Help for Older People Monday to Friday, 9am to 5pm on 0845 601 3321 or 01308 488066 or see their information pages. Do you have a project that inspires people to do the right thing with their waste? Lambeth Council’s Overview and Scrutiny Committee is holding its next meeting at Lambeth Town Hall, on 20 September 7pm to 9pm in Committee Room B6. The meeting's focus will be housing, with items for discussion including resident engagement (resident involvement in the Housing Scrutiny Commission), major works and the council's private rented sector work. Whilst the committee will hear from council officers, they are also keen to hear from residents views on the items on the agenda. The agenda will be published on the Overview and Scrutiny Committee event page on 12 September. Committee chair Cllr Anyanwu will seek to ensure that those who want to speak are given the opportunity to do so (subject to time constraints) so if you plan to attend and would like to know more, or would like to speak at the meeting, please contact Gary O’Key, Lead Scrutiny Officer on gokey@lambeth.gov.uk or tel 020 7926 2183. Every year we sit down with our six main contractors to set community benefit targets, mainly focused on employment and training opportunities for residents.